Time Discrepancy - Todd County auditor Kathleen Flakus twice published notices in the local press that polls would be open on Election Day, November 2, from 7 a.m. to 7 p.m. Central Standard Time (CST). According to government maps, Todd County is west of the time-zone line that splits South Dakota, placing the county in Mountain Standard Time (MST). The Todd County populace routinely operates on Central time. On Election Day, a Democratic election official named Iver Crow Eagle showed up almost an hour late to one Todd County polling place, forcing that polling place to alter its hours from 7 a.m. - 7 p.m. to 8 a.m. - 8 p.m. The time change is allowable under state law. However, Democratic poll watchers asked that all the Todd County precincts be allowed to stay open until 8 p.m. Todd County is heavily Democratic, York says, providing a possible motive for the request. The Democratic lawyers also asked that precincts in Mellette County be allowed to stay open until 8 p.m.; like Todd, Mellette is technically in Mountain time but the populace keeps Central time. The lawyers argued that the polls should stay open until 7 p.m. MST, which is 8 p.m. CST. York says Flakus and the “[l]ocal election officials were flabbergasted” by the request. However, state officials found that the Democrats were legally correct, and the precincts stayed open until 8 p.m. CST. Republican officials attempted to force the polls to close at 7 p.m. CST, York reports, calling the extra hour an “unconstitutional” dilution of other counties’ votes, whose citizens cast their votes “during proper hours.” The Republicans also asked that the ballots cast after 7 p.m. CST be segregated from the other ballots in case a judge ruled in favor of the original closing time. A state circuit judge dismissed the requests without comment, and the polls stayed open an extra hour in the two counties. Witnesses later tell York that they saw well over a hundred voters cast their votes during the extra hour. “Given the voting patterns of the area, it’s likely that nearly all of those extra votes were Democratic,” York writes. “[I]t seems reasonable to estimate that the extended voting hours gave Tim Johnson an additional 200 or so votes” in Todd County alone. Voter Registration Fraud? - Democrats from the state and national party worked to register thousands of new voters during the run-up to the November election, specifically working on Indian reservations. The effort secured some 17,000 new voters, York says. However, he cites a news report that alleged “bounty hunters” were paid ”$3 per head” to register new voters, which he calls “an invitation to fraud.” One Democratic volunteer, Becky Red Earth Villeda, made almost $13,000 from registering new voters. Before the election, state prosecutors said that 15 “phony ballots,” in York’s words, were “associated with Villeda.” The prosecutors were investigating 1,700 others and were considering filing charges against her. South Dakota Deputy Attorney General Larry Long told reporters: “It appears that we were able to get her stopped before she actually cast any fraudulent ballots. But it’s conceivable that she was able to get ballots cast that we don’t know about.” York says that at least three absentee ballot requests—not ballots—from the Cheyenne River Indian Reservation, in Dewey County, may have also been fraudulent. A witness at a Dewey County polling place later alleges that he saw “15 or 20” people come to vote, only to find that records indicated they had requested absentee ballots when they said they had not made such requests. One of those voters told election officials that the signature on the ballot request was not his. At another precinct, another witness says the same thing happened with ten voters, and a third witness says a similar occurrence happened to seven voters at another Dewey County precinct. York says it is “reasonable” to presume that many other occurrences took place, and many improper absentee ballots may have been cast. Sazama tells York that she saw ballots cast at her Todd County precinct that “didn’t look right.” She says she saw several signatures that appeared to match the voters’ signatures, but they “all looked like they had been signed by the same person.” Those votes were counted. York says that along with the “suspicious” absentee ballot issues, “there were widespread problems with voter identification,” including a number of instances where voters presented themselves to an election judge, found that their given names were not listed, and were given the opportunity to vote under what a Republican witness in Mellette County calls “alternate names.” Another unnamed observer says similar instances happened at a polling place in Shannon County, home of the Pine Ridge Indian Reservation. And Assman says he saw similar instances in Todd County. York says that Democratic lawyers at polling places “pressured election officials to allow people to vote, whatever the problem with names,” and quotes an unnamed Republican election official as saying the lawyers “intimidated” local officials. 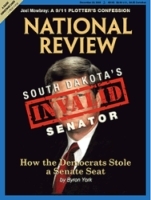 Purged - The National Review will later purge the York article from its database.